The theme of parents' love for their child is a recurring one in children's books, from Love You Forever by Robert Munsch to Guess How Much I Love You by Sam McBratney to Mama Do You Love Me? by Barbara Joose. 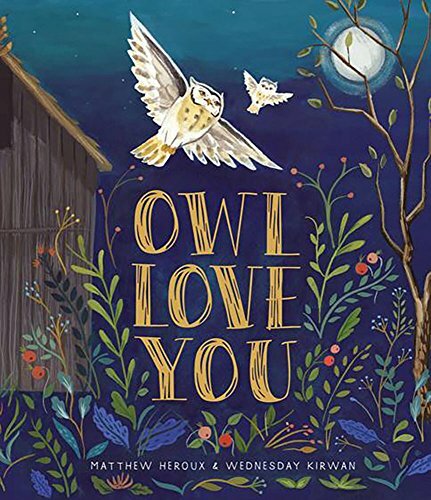 Owl Love You gives the motif a new spin in its word play, the repeated refrain of “Hoo'll” do this or that from the child with the repeated reassuring answer of “Owl” do it from the parent. The nighttime illustrations are soothing and sweet with lots of adorable animals capering through the forest as the pages turn during one night with Baby Owl and Mama Owl (though the parent could be a Papa Owl, why not?). The one problem with the story is the rhyme, always tricky in picture books. Much as writers seem to think rhyming is essential in children's books, it has to be absolutely seamless to work. Any hitch or bump or forced rhyme ruins the flow of reading the story aloud, essential for any picture book, but especially one meant as a bedtime story. “Hoo'll show me how to be curious and clever? The use of “kid” is jarring, a change of voice that doesn't fit with the dreamy tone set before. “Kid” sounds like something an older sibling or a neighbor would say, not a parent, certainly not the owl parent who has been talking before. The need for an extra syllable is clear, but shoehorning “kid” into the rhyme isn't the solution. Surely another one could have been found. “Hoo'll hang with me when my friends aren't around? “Hoo'll snuggle with me when the night is through? “Hoo'll snuggle with me when the nighttime is through? Still, the combination of the charming art and the mostly-lulling rhyme makes this book a good pick for bedtime and a nice introduction to wordplay. You can never be too young to learn how to pun.